The Luxembourg Airport is, by comparison with other international airports, small and easy to navigate. Generally, one needs to present a passport to enter. Travel to the airport is equally simple by bus, taxi, or car. Inside, there is a duty-free shop that sells cigarettes, alcohol and perfume, and another store that sells clothing. There is also a post office, a money exchange and a bookstore. During colder months, a shuttle takes passengers from the airport to the planes. 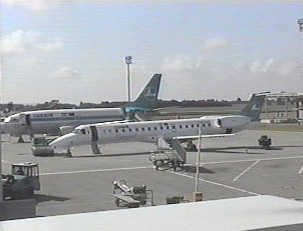 In summer, passengers have the pleasure of walking out onto the runway to board.